Now is the perfect time to start planning exterior home improvement projects. In the past, maybe you’ve focused on painting and fixing the gutters. It’s also possible that you recently had some major landscaping work done. But what about your front porch? Keep in mind that updating your porch is a great way to boost curb appeal and lure prospective home buyers. Read on for five simple yet transformative porch ideas from Chip Wade. Get rid of the clutter – Your front porch could be a popular spot for bikes, garden tools, toys, and sports equipment. 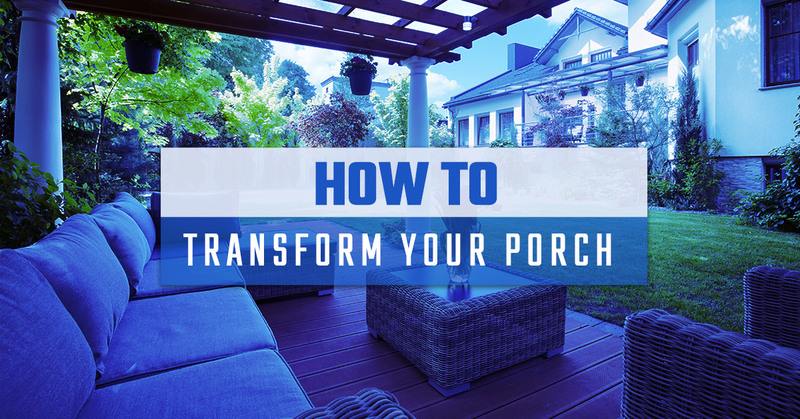 Before you can truly revamp your porch, it’s a good idea to clear out the mess. Remember that a clear space is easier to upgrade and allows you to figure out what kind of furniture you want. No longer does your porch have to serve as a storage area. Add some paint – Does your porch look old and worn-down? A fresh coat of paint can work wonders. Be mindful that textured paints tend to hide the wear and tear better on older wood. Plus, these paints add some grit that prevents the surface from becoming too slippery when wet. Don’t hesitate to reach out to your local hardware store for recommendations. Bring in some light – Wouldn’t it be nice to enjoy your front porch even after the sun goes down? See if an electrician can install overhead lighting structures to brighten up the space. Should that not be an option, get creative with LED lights. Not only are they bright, but LED lights are also safe and long-lasting. However you choose to light up your front porch, avoid choosing products that give off heat, as these attract bugs in the warmer months. Have fun with seating – Now the real fun begins. What’s the vision you have for your front porch? Do you want it to be a space where guests can talk and relax? If that’s the case, then seating is a must. Let your creative juices run wild here! You can do anything from building off-ground seating to a custom bench. Finish off the area with fun outdoor pillows and other decor options you may choose. Swap out the plants – You don’t want to show off your front porch with dead plants everywhere, do you? Try purchasing several hanging plants or create a container garden. Rest assured that our porch contractors will get you situated with the space you always wanted. Call Ready Decks today to ask about our porch additions.